Pop star Tinashe and her professional partner Brandon Armstrong tied for first place on the leaderboard with DeMarcus, a pro football player and Super Bowl champion, and his partner Lindsay Arnold out of the 13 competing couples when they each received 23 out of 30 possible points from Dancing with the Stars judges Len Goodman, Carrie Ann Inaba, and Bruno Tonioli. "That was delightful, delicious -- DeMarcus the dancer... You were so light on your steps. It was really incredible and you are the one to watch!" Bruno gushed after his performance with Lindsay. 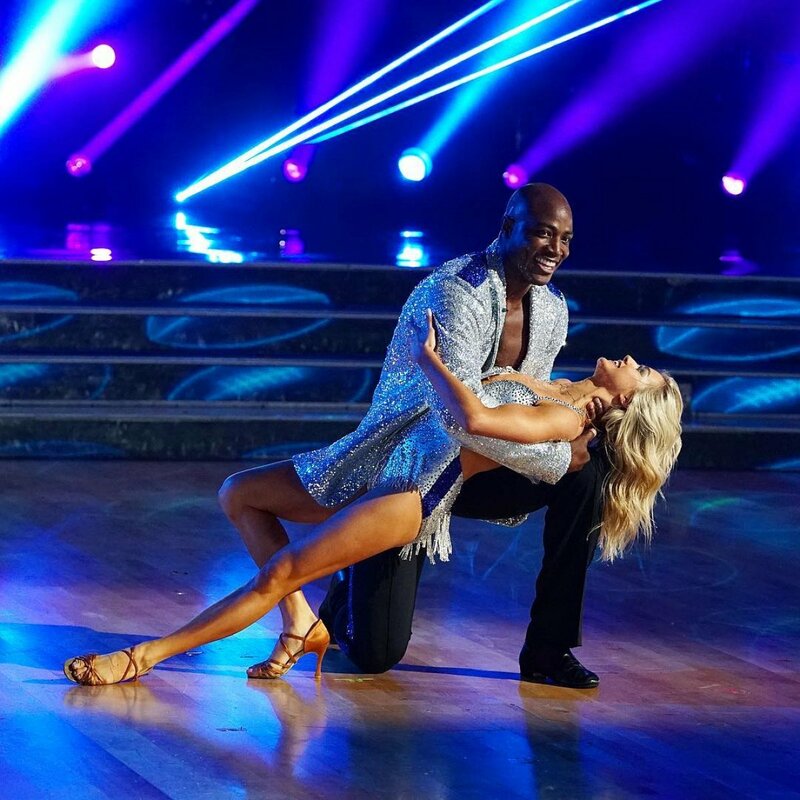 DeMarcus and Lindsay danced the cha cha, while Tinashe and Brandon -- a former DWTS Troupe member who made his debut as a pro partner -- performed the jive. Third place on the judges' leaderboard belonged to actor and Fuller House star Juan Pablo Di Pace and partner Cheryl Burke, who earned 22 points for their salsa routine from the panel. Model and Cover Girl Alexis Ren and partner Alan Bersten finished the night in fourth place after receiving 21 points for their jive routine from the judges. Fifth place on the leaderboard turned out to be a tie at 20 points between country music radio personality Bobby Bones and singer and dancer Milo Manheim. Bobby and partner Sharna Burgess took the stage with a jive routine, while Milo and partner Witney Carson danced the cha cha. Mary Lou Retton, a former Olympic gymnast with five medals, placed seventh on the judges' leaderboard with partner Sasha Farber after they received 19 points from the judges for their cha cha routine. There was a four-way tie for eighth place among the following celebrities, who each received 18 points: Actor and country music singer John Schneider, actress and Facts of Life alum Nancy McKeon, actress and Harry Potter star Evanna Lynch, and downhill skier Danelle Umstead. Three of those couples performed the foxtrot: John and partner Emma Slater, Danelle and partner Artem Chigvintsev, and Evanna and partner Keo Motsepe. As for Nancy and Val, they took the stage with a quickstep routine. Comedian Nikki Glaser, who just overcame an injury on the show, and partner Gleb Savchenko claimed twelfth place on the leaderboard with 17 points after dancing the salsa. And finally, Bachelor in Paradise's Joe Amabile, better known as "Grocery Store Joe," and partner Jenna Johnson landed in thirteenth -- and last -- place on the leaderboard with 14 points. Joe and the reigning mirrorball trophy champion performed a quickstep routine for the judges, but Joe made a couple of obvious mistakes. Joe's girlfriend from The Bachelor franchise, Kendall Long, could be seen sitting in the audience, smiling big and cheering Joe on. Dancing with the Stars will feature another night of competition on Tuesday at 8PM ET/PT on ABC, and the night will conclude with the first elimination of Season 27. Dancing with the Stars is hosted by Tom Bergeron and co-hosted by Erin Andrews this fall.